Stimulus control stabilizes behavior and creates good manners. Cues act like green lights. They tell the horse which behavior will earn him reinforcement at this particular moment. When a behavior is fully on cue, you are saying to your horse that you want the behavior when you ask for it and ONLY when you ask for it. 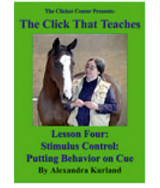 “Lesson 4: Stimulus Control” will show you how to teach cues, and how to use them to create a mannerly, focused, happy horse. When you hear the word “respect”, think stimulus control instead. When you teach a new behavior with the clicker, you’ll find your horse goes through two distinct phases. In the first phase you’re simply getting behavior to happen. At this point your horse doesn’t understand anything about cues. He simply knows that everytime he offers a particular behavior, click, you give him a treat. From his point of view it’s a wonderful game. It’s almost as though he has YOU on cue! His behavior is a trigger that gets you to reach into your pocket and hand him goodies. Is it any wonder that horses love the clicker game? This phase is a lot of fun. You get to see how eager and smart your horse is. But it can also feel very out of control. All you want to do is groom your horse, and he’s trying every behavior he can think of to get you to play the “clicker game”. At this point you need to move on to “Phase Two” of clicker training and put the behaviors on cue. This two hour is divided into three parts. How do you use cues to develop great manners in your horse? Cues: developing a two-way conversation with your horse.